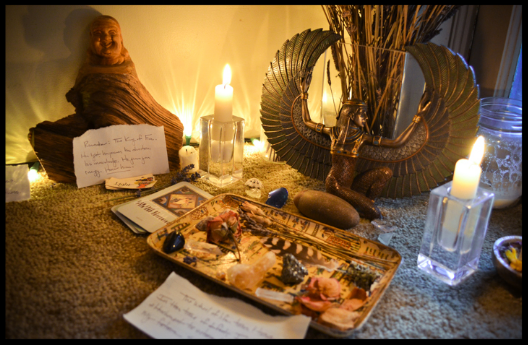 Altars occupy a mysterious space in our cultural psyche and you can find them everywhere. From churches to shrines, altars create space for our hopes and dreams to grow. They create powerful backdrops to our most sacred ceremonies from wedding to funerals. But why are they so powerful and how can you use them in your own #dailyrituals? 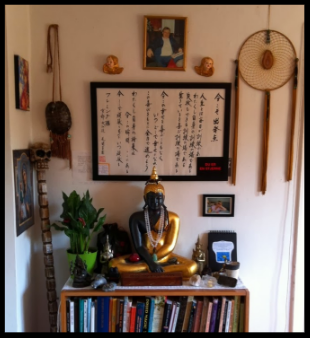 Creating your own #sacredspace is as important as it is simple. It can be done just as easily in your hotel room as your bedroom. 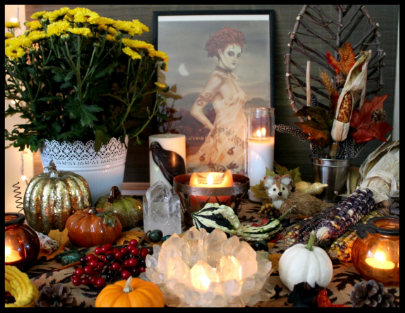 No matter the scale, creating an altar space will create momentum for manifesting in your life. Its is an important tool in manifesting your dreams and setting clear intentions. There are many ways to build an altar but we will focus on indigenous traditions of the Americas. Earth: (North/lower left corner) Earth energy represents the #sacredfeminine and embodies the elements of nature on your altar. It also reminds us of the importance of being “grounded,” an essential element to manifesting what we want to create in our lives. Air: (East/upper right corner) Air energy represents knowledge and the power of the mind. It also embodies courage and bravery. Need to galvanize the winds of courage to seek your life’s true path? The air element is where you want to focus your energy. Include images of birds or feathers. The burning of ceremonial plants such sage, cedar, palo santo, mugwort, copal, and sweetgrass are perfect for working with the air element. At our Sol Medicine Retreat in Mexico we will discuss which plants to use to manifest specific prayers and intentions. Burning a ceremonial incense and using a special feather to disperse the smoke is a great way to focus intentions and prayers associated with the air element. Fire: (South/lower right corner) Fire energy is powerful indeed. Fire represents creative energy, manifestation, inspiration, strong will and sexual energy. It’s association with purification, transmuting negative energy and creating a pathway from the physical world to the spirit. Through our prayers, we make fire a powerful element to work with in our manifestation practices. Candles! A candle should be placed in the south/lower right hand corner of your altar to represent the fire element at play in our lives. Other candles can be placed in the different areas of your altar to help spark the manifestation of your specific desires. Creating additional spaces for family, relationships and career within your altar and lighting a candle within the area you are working helps to focus the energy you need to create. Water: (West/upper left corner) Water energy is all about power and flow. It represents our emotions, intuition, healing and reflection. As beings of the water on planet earth we are deeply connected internally and externally to this powerful and sacred element. A chalice or cup can be placed on the West/upper left corner of your altar and filled with clean, pure water. The use of cups can represent the female form and symbolize the nourishment of our desires. Elements of bodies of water such as sea shells or rocks are another beautiful option to represent the #sacredwater element on our altars. Spirit: (center) “Spirit” is the “fifth element,” and embodies the life force that encompasses and creates all things. In indigenous ceremonies, spirit energy includes the spirits of our ancestors and the mysterious forces which move the elements of this world and the underworld. There is wisdom and power in the elements that are beyond our control. The tides flow with the moon, animals migrate around the planet, flowers bloom, and our hearts beat without any influence of our own. This is the domain of spirit. A white candle, a picture of our ancestors, a mirror, or an image of your spiritual tradition (Jesus, Buddha, mother earth, etc) can all be used to represent spirit. Feel free to use your creativity with the spirit element and choose a symbol to represent what the powerful and mysterious forces of life and the great beyond mean to you. 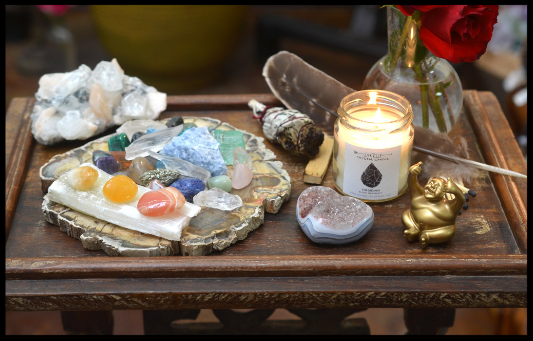 Just remember, “Where the mind goes, energy flows.” Use your altar as a tool to focus your mind on what you are trying to honor and create and watch as this simple and timeless tool helps you bring more of what you want into your life! What Happens During a Psilocybin Ceremony ?